It is not hard to sell any Paneer recipe to me as I am a self confessed Paneer lover.Though I usually do not deviate from the usual PBM route,ever since I tried Matar Paneer,I am open to trying out new Paneer dishes.So it was no wonder when Srivalli posted a step by step recipe of Kadai paneer,I was tempted to make it right away. Fresh Paneer,crisp Capsicum and a melange of masalas in a tomato gravy was bound to be a hit. Unlike side dishes featuring paneer,this one is not very rich or laden with butter/oil/cream to make it tasty.Sometimes,the most simplest of recipes are the most tastiest,don't you agree? Coarsely powder red chilly and coriander seeds and keep aside. Chop the paneer into bite-size cubes and saute in 1 tsp oil till golden brown on both sides.Drain from the pan and immerse in about 2 cups of boiling water and keep aside. Sauté the capsicum in the same pan till it starts browning.Drain and keep aside. In the same pan add the remaining 1 tsp oil and add the red chilly-coriander powder,cloves and cinnamon and sauté for a minute. Add the onions,whole green chillies and stir till it starts becoming golden brown,then add the ginger garlic paste,red chilly powder and mix well. Continue to sauté for two minutes, add tomato puree, salt. Cover with lid and let the puree cook. 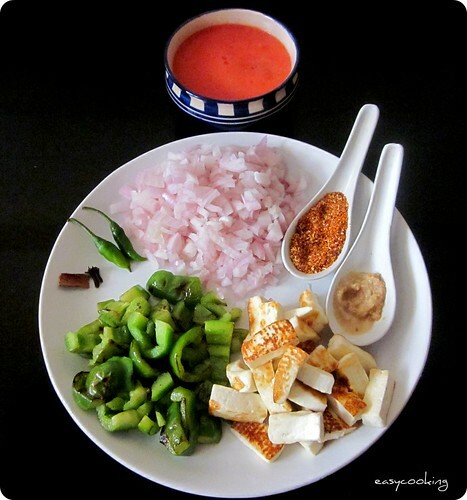 When the tomato puree is well cooked, add the roasted paneer,roasted capsicum and mix well. If you are using fresh homemade Paneer,you can add it straight to the curry.No need to roast or soak it in hot water. Who doesn't love this tasty cheese and paneer anything? This sounds fabulous particularly as its not rich like most of the other paneer dishes. Sometimes eating out is a put off for the sheer amount of fat floating in the dishes.. 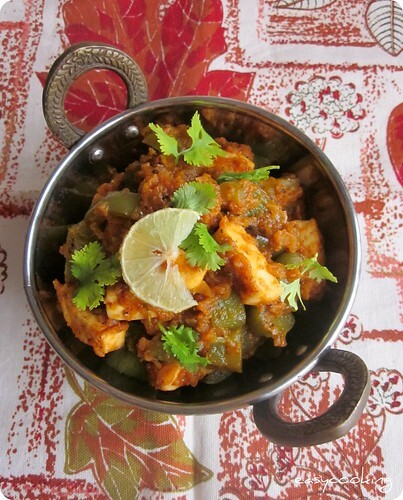 Extremely inviting and fingerlicking kadai paneer.. Yumm!! One of my favourites!! paneer is my all time fav !! looks YUMMY !!! Wow... This is my fav... Looks so good... Mouthwatering. Nice recipe... YUM! Wow looking delicious... 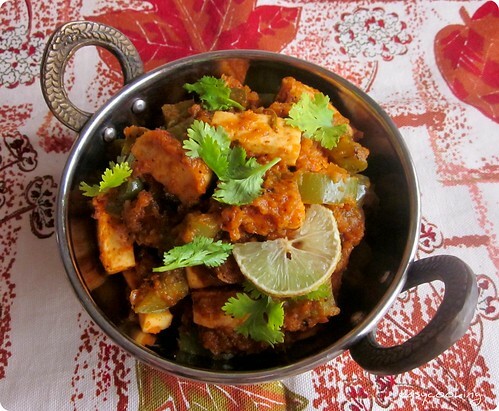 I Love paneer, sure to try it out soon, looks so inviting. Great recipe.